The Audi S8 Plus is the only option on the American market right now after the regular S8 was discontinued in the country. That’s not a bad thing though because the Plus features more power, crossing the 600 hp mark thanks to a twin-turbocharged 4.4-liter V8, and that equates to absolutely mind-blowing performance. With the 8-speed automatic transmission chopping through the gears the large sedan can hit 60 mph in less than 4-seconds and the top speed can be as high as 189.5 mph. 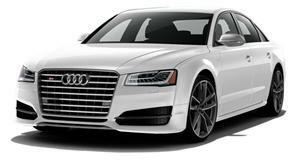 The Audi S8 Plus starts off at an expensive $115,900, but just look at what you’re getting for that money. The Audi S8 Plus is the epitome of a performance sedan thanks to a long sleek body and a powerful twin-turbocharged 4.0-liter V8 coupled to Audi’s brilliant permanent Quattro all-wheel drive system. It’s the kind of car you’d get driven around in by a chauffeur but at the same time it’s the kind of car that you want to drive and be in control of yourself. It’s as luxurious as possible while being ridiculously fast, in fact the Audi S8 is so powerful that it gets off the line with a rapid pace and can hit the 60 mph mark in less than four seconds. There’s a reason that when people talk about top quality interiors that they often reference things in comparison to an Audi. 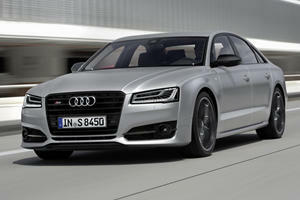 If you could put a new level above premium, that’s what you’d find in the S8. Sports seats with high bolsters are finished in a variety of leathers and patterns, the door trimmings, steering wheel and dash match. As with most luxury German cars, finishing can include brushed aluminum, carbon fiber and wood making for many ways to personalize the car. Occupant space is at a premium too, there’s loads of it. Up front the driver and passenger can choose just about any seat setting with 22-way settings, even as far back as possible, and it wouldn’t interfere with the rear passengers, even if they were on the tall side. The cabin seals so well that you can hardly hear the outside world and you’d be forgiven for checking the tachometer to makes sure the engine is still running. 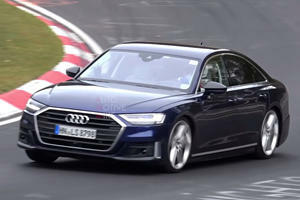 When an Audi sports either an S or an RS on the rear, you know it’s going to be fast, even on the large saloon that is the S8. There are a few different drive modes available, as well as a customization that will combine all of the settings you prefer. The steering is sharp but doesn’t have a lot of feedback, but when you’re driving at pace you may not notice. The cornering is great thanks to the ECU-controlled air ride suspension and damping that forces stiffer settings when needed. The 8-speed automatic transmission is flawless and provides lightning quick shifts when left to its own devices, but you also have the option of controlling shifts via paddles behind the steering wheel. When this is done the ECU doesn’t force an up-change so you can hold a gear until the limiter comes in. The car S9 Plus becomes silky smoothie and sedate when in comfort mode showing a true Jekyll & Hide personality. Executive saloons and performance never used to go together, but over the last ten years we’ve been seeing more and more of these cars reach the market with insane engine setups producing ridiculous amounts of power. The twin turbochargers are bolted on to a V8 measuring in at just 4.4-liters, but with the magic of boost the power on tap in the Audi S8 Plus passes the magical 600 hp mark being rated at 605 hp with a powerful 553 lb.ft of torque. The 8-speed automatic transmission is lighting fast when changing gears but manages to stay smooth too resulting in power feeling linear and never ending. Audi says the S8 Plus will it 62.1mph (100 km/h) in as little as 3.8-seconds and will top out at 189.5 mph with the Dynamic package removing the speed limiter. To get it back to sane speeds there’s optional carbon-ceramic brakes. The interior of the Audi S8 Plus is the only place you could potentially fault the car, with it being released to the market in its current guise in 2012 and updates and refreshes mainly tailored to the exterior styling and engine changes, the interior is a looking a little old now. There’s still good tech on board, the car still uses the older Audi MMI Navigation Plus System interface for the infotainment system that’s easy to navigate over two LCD screens. Audio is via a 630-watt Bose system, but if you want to connect your iPod you’ll need to do it with a connection cable – a feature proving the aging interior tech. Safety includes ESC, ABS with traction control, dual stage airbags and an array of cameras to help with positioning and parking the large sedan. The Audi S8 Plus is an imposing looking sedan that has the right bits under the skin to give it matching performance, blistering performance. With 605 hp on tap and a top speed of almost 190 mph the Audi S8 Plus is one of the fastest sedans you can buy, and while it’s starting to look a little dated in some areas, it’s still a very desirable executive saloon. It’s not cheap, but this is one of the rare occasions where you get what you pay for – a lot. 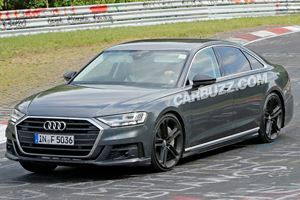 A prototype of the super sedan was spotted flexing its muscles at the Green Hell completely stark naked.